This is the next post to help you get your baby to sleep through the night. It’s main focus is getting your baby on a good schedule during the day. My first post on How to get your NEWBORN to sleep ALL NIGHT focused on 3 steps. The first was, for the first week, love and enjoy holding your new bundle of joy! The second step was to start writing down when your baby eats and sleeps. Lots of times your baby creates their own schedule, but as mamas we may not recognize it. The last step was to get your baby on a feeding schedule. Feed your baby 2.5-3 hours apart and work naps between those feedings. 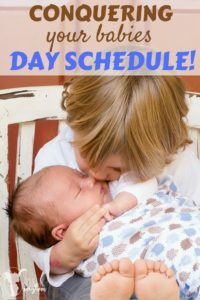 This post will focus on specifics on your babies day schedule. Here is an example of the schedule that I had for each one of my boys! My babies were such good babies and I attribute it a lot to getting them on a schedule! It freed up my time, and I wasn’t guessing when I would need to feed baby. 8:00 – 8:30 – I lay baby down for a morning nap IN THEIR OWN BED! Get them used to this from the beginning. Start early and it will make your life easier later. 10:30-12:30 – At first your baby may take a small cat nap during this time. Eventually they will stay awake. You can put them in a bouncer, swing, or lay them on a blanket on the floor. Let them explore their surroundings. 1:30-2:00 – Depending on how long your feedings are, I usually put baby down for their afternoon nap after a good burp! Make sure you get those bubbles out. Again, lay your baby down in their own crib for this nap. 4:00 – Feed baby. DON’T EVER LET YOUR BABY SLEEP LONGER THAT 2-3 hours during the day. Wake them up so they can get on a schedule. If you let them sleep all day, you will be having a party all night! 4:30-7:00 – Baby may take a small cat nap, but will eventually stay awake during this time. Hold them, place them in a swing, or on a blanket on the floor. 7:30 – After you feed baby, I would play and keep my baby up til the next feeding. You can give your baby a bath or play with them. Remember take lots of pictures while you are staring at your precious wonder! 10:30 – When my babies are just starting to get on a schedule and not sleeping through the night, I always hold off on giving my baby a bath until after the 10:00 feeding. I do this for a couple reasons. First, it is soothing and most babies enjoy having a warm bath. Second, it moves them around and usually gets more bubbles out of their tummies. Swaddle your baby and they are all set ready for bed. At first I always keep my baby in my room. I set up a crib or a porta crib that is the same height as my bed, and place it right by my side of the bed. This will help when we start tackling their night schedule, which I will talk about in my next post. One of the most common things I hear from new moms is, “MY BABY SLEEPS ALL DAY, and IS AWAKE ALL NIGHT!” As busy moms, it is easy to let your baby sleep while you are getting stuff done! If you let them, you will be up all night and your days will become a fog from lack of sleep. Take the time and get them on a schedule. The above schedule is just an example. You can adjust it to your liking, just remember to feed every 2.5-3 hours and 2 good naps a day.